Equipment: Audio Equipment. Electric Fan. Washing Machine. Television. DVD Player. Microwave. Coffee Maker. Spacious, comfortable, bright and very quiet apartment. Its colonial style, makes it unique and rewarding for those who visit. You enter through a hallway anduluz style, full of lamps and plants. You enter the apartment through a patio with brick floor and plants, which give every room in the house. It has a bedroom on the ground floor and one on mezzanine, a spacious living-dining room, kitchen and bathroom. Access to the bathroom from the patio. Its ceilings are high. It is very nice enjoy the patio for breakfast, lunch or dinner. Or just for reading. If you want authentic atmosphere rather than an antiseptic hotel, then this is what we offer. An ideal apartment for the summer. I would stay again! Very nice. Light and roomy. Good location. Reasonable rates. Muy buen departamento, recomendable y generosamente atendido por sus propietarios! Gracias por una agradable estadia. Vibeke, Jose, Lea y Magda. Hermosa casa, muy silencioso el sector. Perfectamente equipada y muy limpia. Su dueña muy cálida y amable. Excellent. This is a charming apartment in a friendly enclosed street. Convenient to stores, bars and the city. The owners are incredibly friendly and attentive. Couldn't recommend it higher. Die ruhige Wohnung mit sonnigem Innenhof war sehr entspannend und wohltuend. Wir haben uns sehr wohlgefühlt. das casa San Telmo Team war immer sehr hilfsbereit und hat uns bei jeder Frage geholfen. Das apartment ist sehr gross und hat Nostalgie, so wie der Stadttei San Telmo, in welchem es liegt. LA VERDAD ESTOY MAS QUE SORPRENDIDO POR LA SERIEDAD, CLARIDAD Y SEGURIDAD QUE ME TRASMITIERON ANTES DURANTE Y DESPUES DE HABER DISFRUTADO DEL HERMOSO DEPARTAMENTO QUE ALQUILE. DESTACO LA CONFIANZA TRASMITIDA Y EL EXCELENTE ASESORAMIENTO QUE ME BRINDARON DESDE UN PRINCIPIO. COMO ASI TAMBIEN QUIERO RESALTAR AL LUGAR CALIFICANDOLO COMO HERMOSO, TRANQUILO, HIGIENICO Y MUY SEGURO, TANTO YO COMO MI FAMILIA NOS SENTIMOS MUY AGUSTO. Ein tolles Appartment, es ist genauso, wie es auf den Fotos rüberkommt. Der Patio ist toll, wir haben dort fast jeden Abend mit einem Drink ausklingen lassen. Die Vermieterin Veronica wohnt in der selben Anlage schräg gegenüber und ist sehr herzlich, freundlich und hilfsbereit. Wenn wir nächstes Jahr wiederkommen werden wir versuchen wieder dieses Appartment zu mieten! el trato con la agencia fue cordial, Santiago contesto todas mis preguntas e inquietudes. La casona es hermosa, muy cómoda, esta muy bien ubicada, ideal para pasarlo en familia. la dueña es muy amable y estuvo atenta a todas nuestras Necesidades. Si queres viajar a buenos aires y sentirte como en tu casa te recomendamos esta casa!! Lovely apartment in a great neighborhood. Veronica (the owner) is very kind and accomodating. This apartment was beyond our expectations. 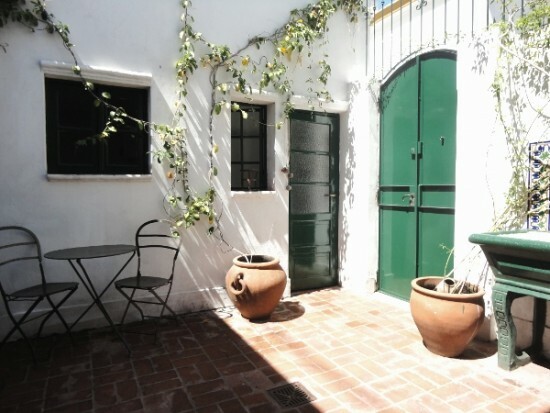 It\'s simple historic design, the wonderful little patio out front, and its great location in San Telmo, our favorite neighborhood in Buenos Aires, made this an amazing place to stay. The owners who live just across the way are very helpful and friendly, and helped add to our wonderful time in this apartment. After only a few days, we decided we could stay in this apartment forever and be happy.